Dennis Aubrey’s writing is as fine as his photography, fathoming the depth and height of the human experience. This Via Lucis piece on the power and complexity of memory shouted out to be shared on Views from the Edge. Recognizing truth is a matter of experience because it involves distinguishing the real from the illusory. Experience itself is a product of memory. And memory is even more complex than truth. And so the pattern gets more multi-faceted the deeper we look, like one of Mandlebrot’s mathematical phantasms. What appears at first simple becomes infinitely complicated and intricate. Some memories we remember as dreams, in the present tense; others as historical phenomena that stay safely in the past. Some memories carry their meaning with them. Others mean something because of their relationship with something that occurred in the past. Others depend on the future to reveal their significance. This is the web that is woven back and forth, across and through time. Dennis Aubrey’s Via Lucis photographic reflection on the different between Gothic and Romanesque architecture opens the Infinite Interior I needed this morning. If you, too, are looking for light in the midst of darkness of whatever sort, this is for you. If you read nothing else, scroll down to the last paragraph and ponder our own infinite interior. Dennis Aubrey, PJ McKey and Via Lucis are Views from the Edge‘s favorite companions on the way. There is a conceptual difference between Gothic and Romanesque churches and cathedrals. While the Romanesque builders paved the way for the Gothic, there is a deep and wide chasm between the two worlds. It starts on the outside – Gothic cathedrals make you want to sit on a bench and admire the exterior. One enters later and experiences the wonders of the soaring internal architecture. The exterior of Romanesque church architecture is different, much simpler. It is dominated by three features – the clocher, west front, and the chevet. The clocher (or belltower), like the contemporary church steeple, identifies the structure from the distance as a church. We post Dennis Aubrey’s latest epistle for a number of reasons. Readers of Views from the Edge may recall that the Via Lucis photographic essay on the stones singing at Vizelay inspired a sermon on the stones singing. Here the monk who wrote the history of these Romanesque churches comes out from the shadows in a lovely tribute by Dennis, complete with pictures of PC and Dom Angelico Surchamp. We are finally home again after two months photographing in France, Spain, and even a little bit of Italy. We drove 6,960 kilometers during that time at an arrive speed of 51 kilometers an hour, which translates to 4,344 miles and a dazzling 32 miles per hour. This demonstrates the narrowness of the country roads where we drive and the amount of time we spent in the Pyrénées and Alps. Until we hit the highway returning to Paris, the average speed was 48 kilometers per hour! Once again Dennis Aubrey’s writing and photography on Via Lucis Photography of Religious Architecture offers a rare jewell worthy of wider circulation. I couldn’t see nor hear a living creature. In 1130, the master builder Gervais built a Romanesque cathedral in the thriving episcopal town of Béziers. Built eighty years before Notre Dame de Paris, it had a comparable nave height as that Gothic masterpiece and was 50 meters long. Evidence given at the time indicates that it was a truly remarkable structure but it lasted only 79 years. The Cathedral of Saint Nazaire was burnt to the ground on July 22, 1209. In a world where what passes for news are articles about the megalomaniac Donald Trump, the Kardashians, and the Jenners, we occasionally find something worth consideration. On August 25 a funeral mass was celebrated in the Italian town of Montefortino at the chiesa della Madonna dell’Ambro. The recipient of the mass was a Capuchin friar, Padre Pietro Lavini who lived as a hermit in the Sibylline Mountains near Rubbiano Montefortino and along the Gola dell’Infernaccio, the Gorge of Hell. 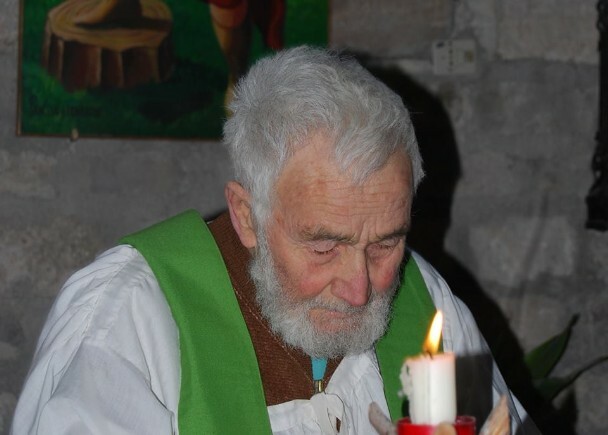 A thousand people attended the service of the man who died two weeks prior, on August 9, 2015. Why did they come to this mass? What did Padre Pietro accomplish with his life as a hermit? “Blameless people are always the most exasperating.”– Mary Ann Evans [pen name, George Eliot], Middlemarch, A Study of Provincial Life, 1871. Blamelessness and exasperation have characterized both sides of a recent conversation on Views from the Edge. Not blamelessness exactly, but certainty, positions that seem to each party to be apparent and true beyond a doubt. Each of us has become exasperated with the other. Jesus’ word to the harsh critic of others – “You hypocrite, first take the log out of your own eye, and then you will see clearly to take the speck out of your brother’s eye”- is forgotten or ignored. Claims to righteousness and suspicion of the other replace self-criticism and magnanimity. We live increasingly trapped in separate bubbles of survival in the war of ideas, convictions, platforms, moralities, religions, and ideologies in the search for security. Instead of bubbles, Dennis Aubrey’s A Patron for Prisoners uses the metaphor of prison, quoting a sage from the 5th Century C.E., Saint Léonard of Noblat, the patron saint of prisoners, whose “Song” (based on Psalm 107) describes a hope for liberation from the prison cell whose doors we have locked from the inside. He hath liberated those in bindings and many nobles in iron manacles. Saint Léonard’s Song ends with the release of the nobles, the only class of people named among the liberated throng. It is no mistake that he includes them among those to be blessed by release from iron manacles. We are all bound in the prison cells of logs and specks, blameless and exasperated, fearful of our survival on the other side of the release. Gordon C. Stewart, Chaska, MN, August 19, 2015. 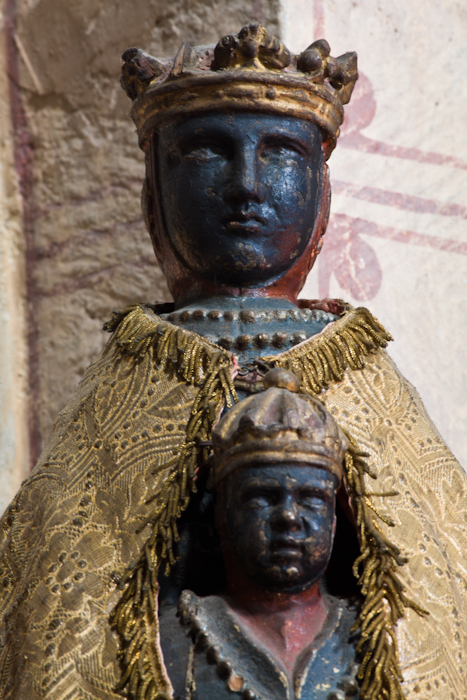 Crusader Madonna and Child courtesy of Via Lucis Photography (Dennis Aubrey and P.J. McKey)How differently people of different times view life is masterfully illustrated by Dennis Aubrey’s post . .Dennis Aubrey’s post . Dennis Aubrey’s post The Throne of Wisdom demonstrates how peoples’ views of life are shaped by their times in history. During the Crusades, Mary and the Jesus of the Gospels become the authorization for killing Muslims. The executed Jesus of Nazareth becomes the Knight Templar, angrily taking up the sword against the unbelievers. Mary, the iconic “Mother of God” of Catholic and Orthodox Christian veneration, is turned into the Mother of Christian Jihad. 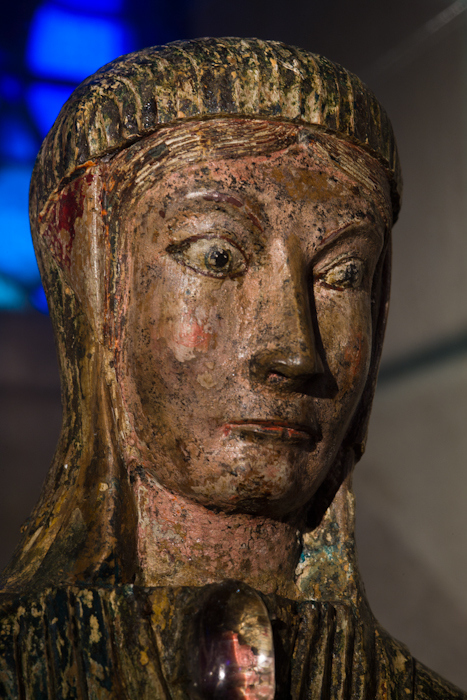 Pictured below is an altogether different Madonna (12th Century from Notre Dame de Vauclair, Église de Molompize, Molompize [Cantal] Photo by Dennis Aubrey) who seems to be looking with horror at what is happening. There is a great struggle today over which Madonna to enthrone. Our Lady of the Crusades is back. For example, click HERE for Sen. Tom Cotton, author of the letter to Iran signed by 47 U.S. Senators, interviewed by CBS host Bob Schieffer on Face the Nation. Thanks to Dennis and P.J. for prompting this post. When we look carefully at where we come from, we sometimes see the darkness today in the clearer light. Our friend Dennis Aubrey posted “The Destruction of History” today on Via Lucis, lamenting the latest in the sordid history of religion destroying history and art. Dennis Aubrey and P.J. McKey love beauty, history, and the religious architecture of Gothic and Romanesque churches they photograph in Europe. Sometimes, like today, they express a profound despair over the destruction done in the name of religion. “Now we have word that ISIS has defaced and destroyed artifacts in Mosul, including Assyrian statues of winged bulls from the Mesopotamian cities of Ninevah and Nimrud. Video released by the newest barbarians to assault the cultural history of humanity shows a man using a power drill to deface the works. Years ago during a sabbatical in St. Andrews, Scotland, the destruction wrought there by my Scottish reformation forebear John Knox and his followers chilled my soul. The people who bred and raised me – Presbyterians of Scottish descent and religious sentiment – did this. They took the commandment to have no other gods as license to destroy, maim, and burn church art and heretics. Their blood runs in mine. Their DNA is mine. And, if confession has any meaning or merit whatsoever, the children of such crimes must say we’re sorry. Really sorry. Repentant. No more destruction. No more following the orders of bully prophets, no matter whose name they claim to honor. Thank you, Dennis, for your post. On behalf of my ancestors and in the spirit of spirituality of beauty, love, and peace on the other side of destruction, thank you for your artist’s eyes. Thank you for your courage. Thank you for the hope in something better in a barbaric time. – Rev. Gordon C. Stewart, Presbyterian minister Honorably Retired, Chaska, MN, March 4, 2015.